Learn how to seal corked bottles. Have you made flavored vinegars or bean bottles and used corked bottles? You have seen the ones in stores and gift shops and they have wax on them. Well, they are very easy to do. 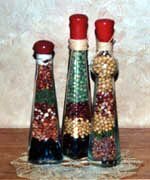 You can make some really pretty filled cork bottles with different colored macaroni and lentils. You can use yellow and green split peas plus many different colored beans. You can also create some very pretty flavored vinegars with citrus and different herbs. I have seen people just make pretty bottels with water and herbs or citrus fruit to be use just for decoration. All you have to do is use your imagination and you will be suprised at what you come up with. Instructions Melt the paraffin and beeswax in a small tin or coffee can placed in a pan of simmering water. Be very careful because paraffin is flammable! Use low heat. Add crayon of your choice of color. You donâ€™t have to add color if you donâ€™t want to. Add cinnamon or spice of your choice. When it is all melted dip the top of your corked bottle into the warm wax. Allow excess to drip back into the can. Rotate bottle slowly as wax cools for even distribution. You may need to dip the bottle several times to get a thick seal. Thatâ€™s all there is to it. These make wonderful gifts and people love to receive them. If you have any questions or crafts ideas please contact me and I will add it to my site.